Aksa Joseph receives Communion from Bishop Edward Deliman. 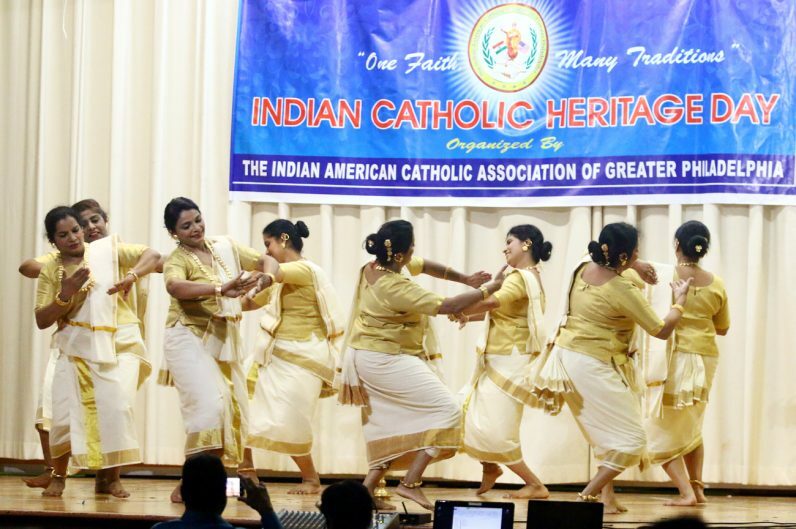 It was Indian Catholic Heritage Day on Aug. 12, sponsored by the Indian American Catholic Association of Greater Philadelphia and celebrated at St. Thomas Syro-Malabar Catholic Church in Northeast Philadelphia. The congregation was mostly India-born adults and their American-born children, many in the colorful festive garments of their native land. 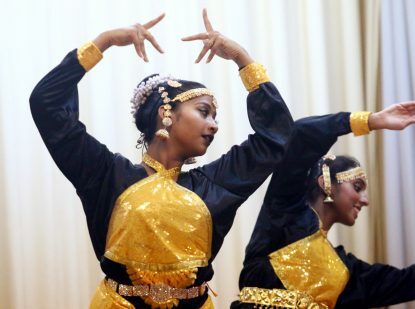 For the most part they were members of the Syro-Malabar Rite Catholic Church, and the Syro-Malankara Rite Catholic Church, with a smattering of Roman-rite Catholics, all with a common heritage. While it was billed as Indian Catholic Heritage Day, it was also a celebration of the 70th anniversary of India’s independence as a nation. Auxiliary Bishop Edward Deliman, who was the principal celebrant of the Mass along with local Indian priests, picked up on this in his homily. “Ethnicity gives us identity,” he said, relating his own ethnic heritage. “My family brought traditions from Eastern Europe that I hold dear in my heart and that I try to observe even at this point in my life. I will never forget them. But Indian Independence Day is really Aug. 15, when the Catholic Church celebrates the Assumption of the Virgin Mary, an important date on the Christian calendar. Bishop Deliman also alluded to this. “The life of Mary is a lesson on life for us. Her life is worthy to imitate,” he said, tying her virtues of humility, purity and hope to the colors of the flag of India. India, which is mostly Hindu and Muslim, has a Christian minority that by strong tradition traces back to evangelization by St. Thomas the Apostle in the first century A.D.
Those Christians today are centered in Kerala in southwest India. They follow Syrian rituals and are mostly either Orthodox Christian or Catholic. 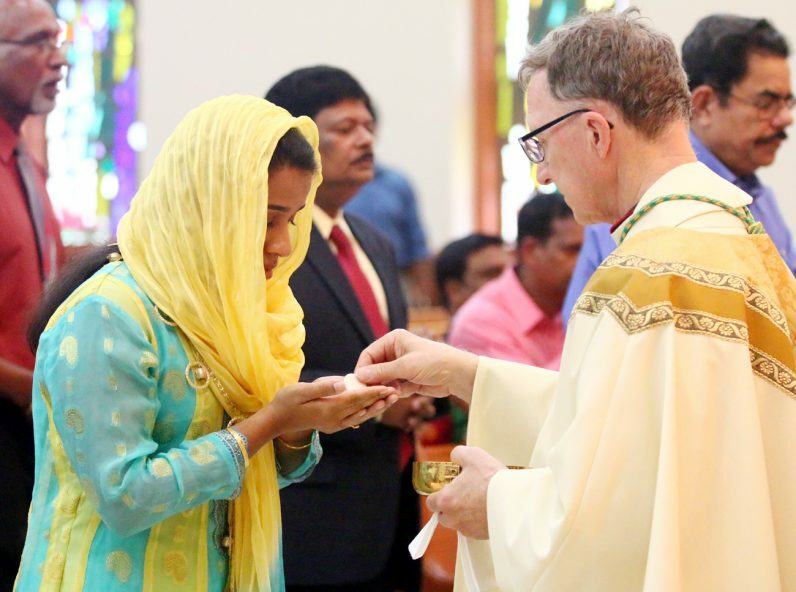 Most Catholics are either members of the Syro-Malabar Catholic Church or the Syro-Malankara Catholic Church, both of which came into full communion with the Holy See at different times. Because Kerala has the highest degree of education in India, many of the Catholic immigrants to America are professionals. While St. Thomas is the main worship site for Syro-Malabar Catholics in the Philadelphia area, Syro-Malankara Catholics worship at St. Jude Malankara Catholic Church on Cheltenham Avenue in Philadelphia. The two churches are about six miles apart. The faithful all came together at St. Thomas for the Indian Catholic Heritage Day festivities that included the liturgy, traditional dancing and Indian foods. 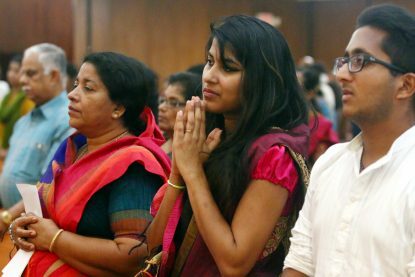 While there is no exact number on how many Indian Catholics are living in the Philadelphia area, Charly Chirayath, the president of the Indian Catholic Association, estimates there are about 500 families with about 2,000 people. About 350 of the families are Syro-Malabar and most of the balance Syro-Malankara. “We are growing,” he said. He himself came to the United States 37 years ago. Already a college graduate, he completed his studies in engineering at the Catholic University of America, and has been working in that field since. Like many in his community he has kept up his ties to his country of birth by visits to India. What was striking was the number of young people at the Mass and celebration, including American-born teens Maximus Damian and his sister Genova, attending with their parents. I love to hear of different cultures in our Catholic faith. Indian Catholic Heritage Day is a fine initiative.